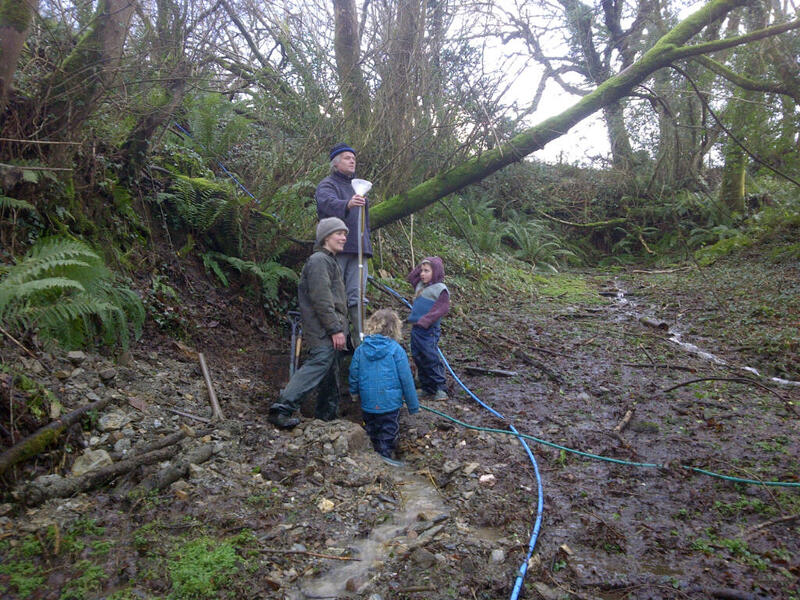 The February Workday was dedicated to carrying out some preparation work ahead of installation of a Ram Pump from a spring on the Trust land to pump water to the top of the farm. Ram pumps are ingenious devices that utilise the power of water flowing into the pump down a drive pipe to push some of that water up a delivery pipe. A more detailed explanation of how ram pumps work will come in another post. We started off the day laying out 150m of 20mm blue pipe, which will form part of the delivery pipe, taking water from the ram pump up to the top of the land. 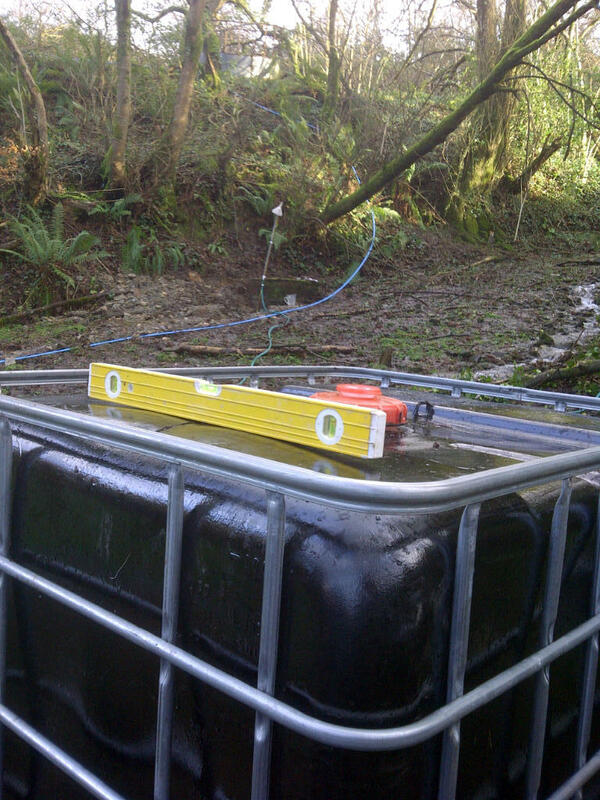 The next stage was to position an IBC tank to act as a reservoir for the ram pump. The Trust spring collects into a concrete and brick sediment trap box, from which we are planning to fill our reservoir tank. 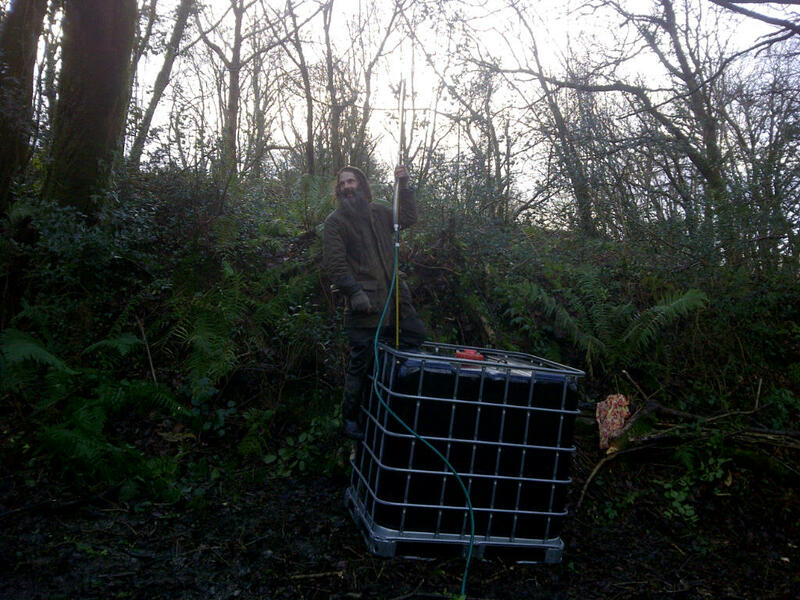 After a fair bit of digging, one group managed to find the bottom of the box and the exit point of an existing pipe, while the other cleared fallen branches and debris from the place where we wanted to put the IBC. We are positioning the IBC on the other side of the stream from the brick box so as to get the best line for running a pipe down to the ram pump. A pipe will be run to it from the brick box for filling. We put the IBC roughly into position, then we needed to check it’s level in comparison to the spring. We need the top of the tank to be level with the pipe that exits the bottom of the brick box. To check the levels we used a classic piece of permaculture kit – a Bunyip. Our bunyip consists of two one metre lengths of clear pipe attached to bamboo canes. Lengths of an old tape measure are attached to each cane to give a readable scale. The two clear pipes are then joined by a length of hose. Back at the spring, Jono took one end of the Bunyip and stood by the brick box and Phil took the other and stood by the IBC. The whole thing was then filled with water, such that the level of water could be seen in each clear tube. The idea behind a Bunyip is that water in the tube is part of one column, so will settle at the same level at both end. Phil holding the other end of the Bunyip on top of the IBC to find the level with the brick box. A stick was pushed into the ground to mark the level at which the top of the tank needed to be at, then we pulled the tank aside and dug away and levelled the footing under the tank such that it would sit flat and at the correct level. The next work day will be Sunday 9th March, 10.30 until 4pm. A warm welcome to anyone who would like to join us. The IBC in position and levelled, with the brick box and blue delivery pipe in the background. This entry was posted in Permaculture, Volunteer Workdays and tagged ram pump, spring, using a bunyip, volunteer workday. Bookmark the permalink.